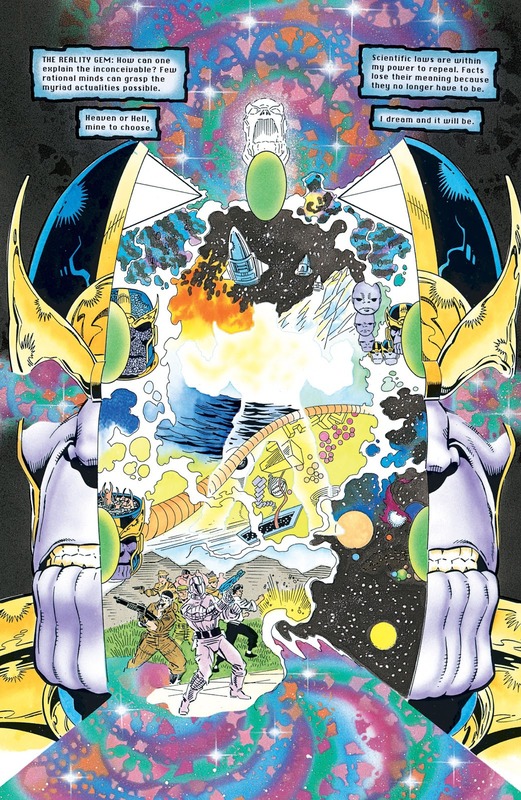 Y'know, there are times when I feel like one of the worst things Starlin ever did was latch onto Thanos and the Infinity Stones as a collective concept, since not only can he never let go, but neither can Marvel. Where do you go when you hit levels like this for the character and the universe? No matter what happens next, you'll always be hobbled by the mere existence of such reality-warping, all-powerful artifacts, as we've seen time and time again. 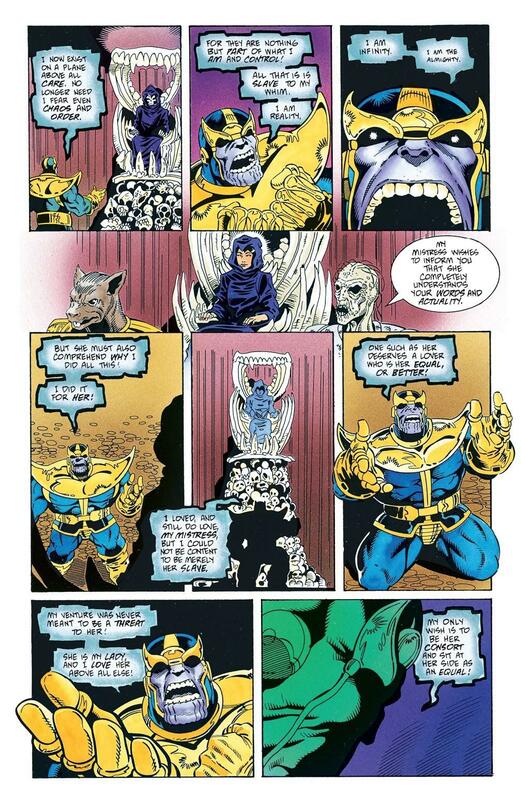 No matter what, Thanos' high point will always be the time he possessed infinite cosmic power and still sabotaged himself. 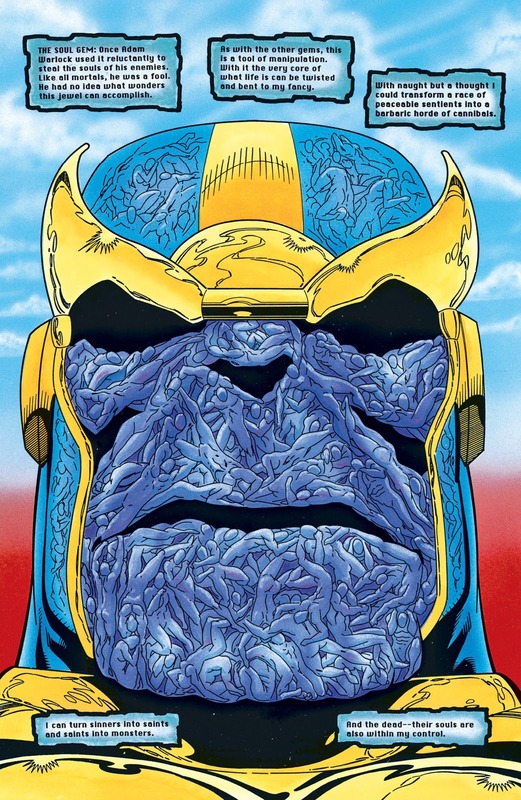 Honestly, I thought they did a pretty good job with Thanos (more or less) up until Annhiliation. 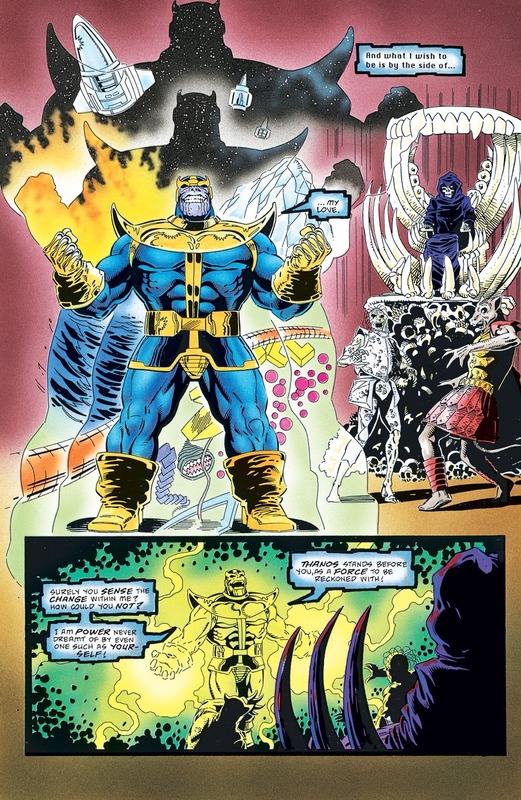 After Infinity Gauntlet, he was the more or less retired bad guy who would come out of the wood work to step in when things were going to get cosmically bad. He certainly wasn't beloved or trusted by any, but he lived in a nice gray area that meant he could be antagonistic when it suited his purposes. 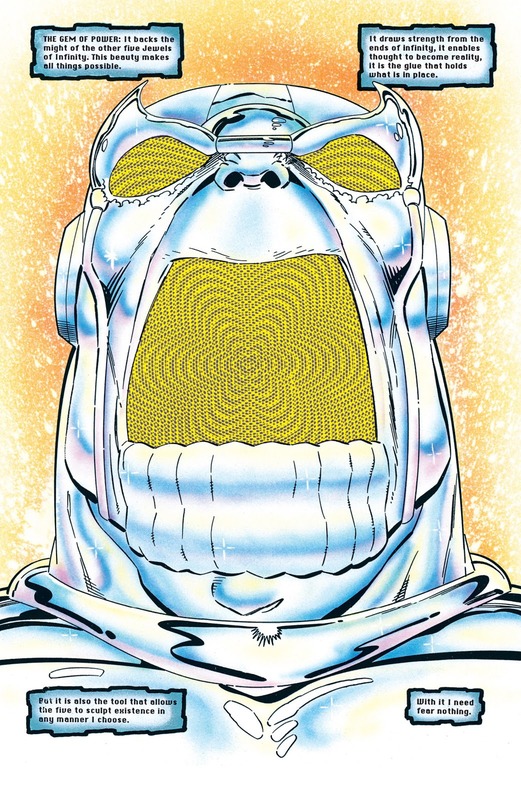 But writers wanted him to be Marvel's Darkseid, so we'd occasionally get him showing up as a cosmic bad guy for some reason. But then he'd be back to starring in his own book fighting cosmic horrors, or something. 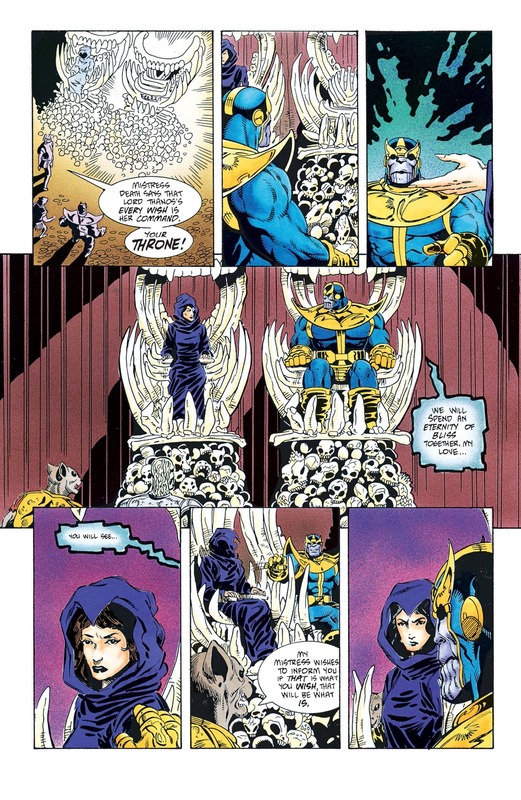 And so it went up until Bendis got his hands on the character after the Thanos Imperative. Starlin's book aside (And I still don't know where those fit in continuity), since then he's been more or less mustache evil for the sake of being mustache evil. Even Hickman played into it. 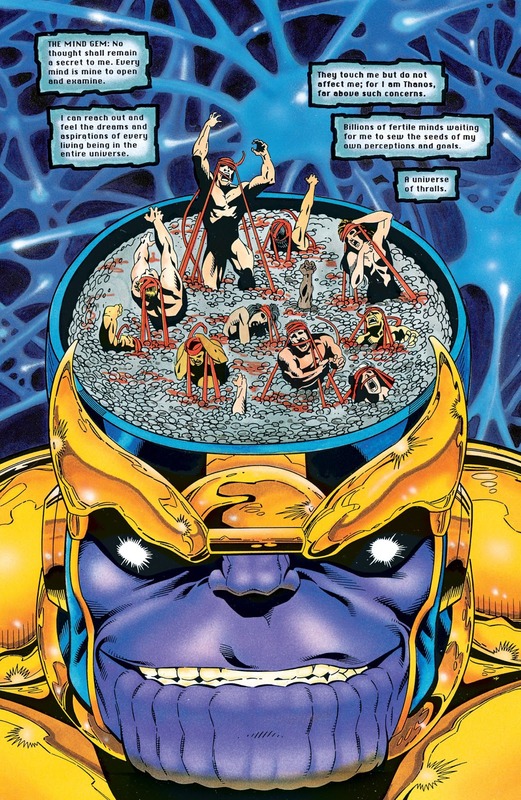 I think it was the fact that everyone knew after Avengers that Thanos would be coming *eventually* so the comics wanted to play with him in more of the 'evil' space but failed to account for it, so he just because another casualty of writers wanting to write movie versions of characters without doing due diligence on what their comic counterparts were actually like (hello again, Bendis). 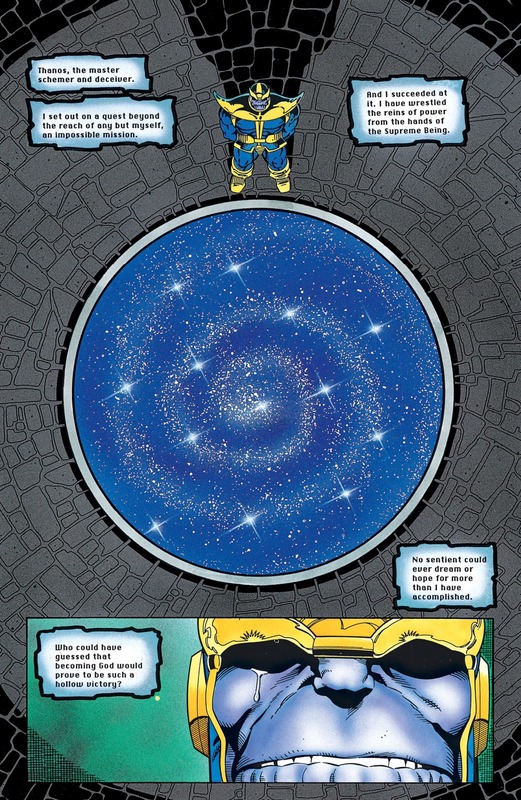 Think even Starlin realised he'd made them too overpowered after Infinity Wars, when the Tribunal comes along with the edict they can never be used together ever, ever again. Though really, the sensible solution to that would've been to remove the gems from the board altogether. It wouldn't have stopped the almost inevitable moment when some writer wanted to use them again, but it might've made it slightly harder than Bendis' "wait, weren't these not supposed to work?" "Meeeeh." The problem is, like Thanos, the gems losing their mystique from overuse by writers who just plain don't care (that, and the forced attempt at synergy by writers who just plain don't care). It really deflates their supposed power and glory when you've got whole storylines about guys like the Hood or Turk Barrett getting their mitts on 'em, and the end result isn't them finding their brains dribbling out of their nose. It seems that comics, like Hollywood, never adheres to the old adage of "Leave 'em wanting more." 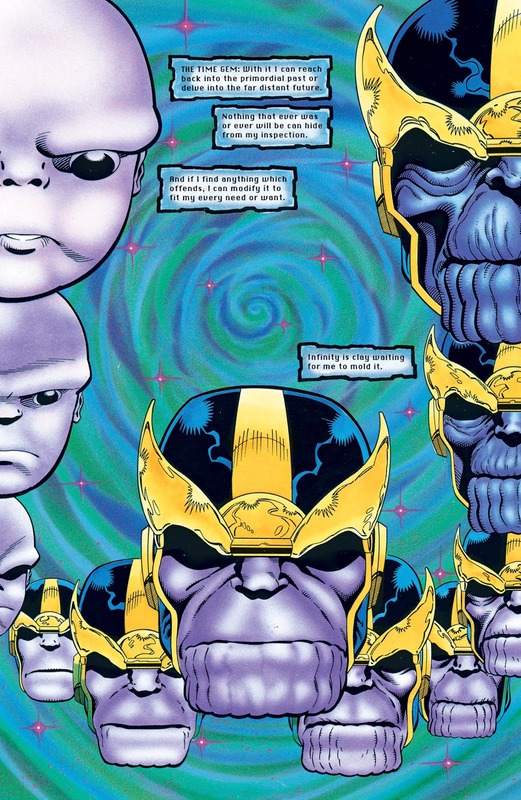 As said, I think that was why up until Annihilation (and even, to a lesser extent, during Thanos Imperative) Thanos worked because it was acknowledged. He had gone so far as he could in the "Tyrannical God" stage, and failed. The only thing he could do about it was learn. 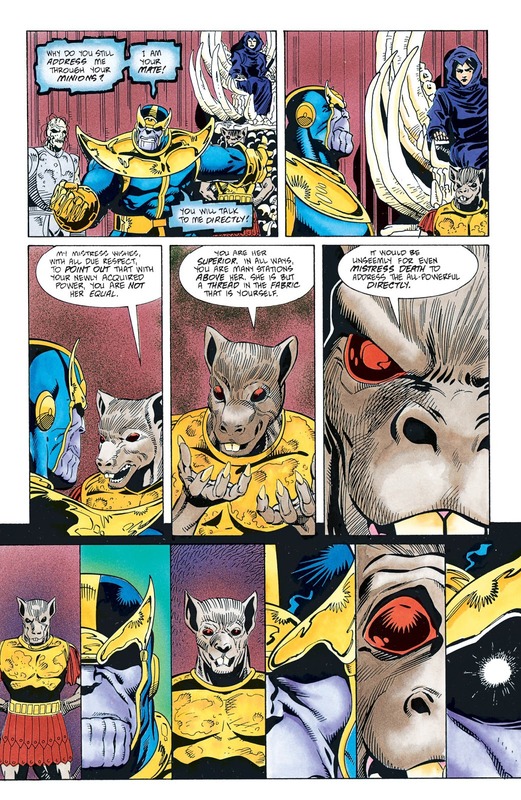 And that's why he in Infinity War/Crusade is mostly a kind of reluctant ally, and in the Thanos series is actively trying (and failing, he is obviously not good at it...) to be a more heroic figure. Even in the GOG story he was resurrected to fight Magus and the Cancerverse and kind of worked. 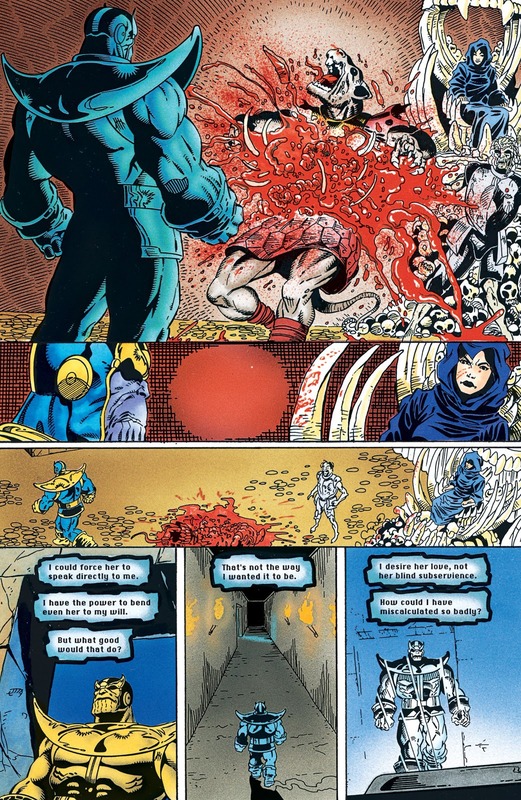 And then came Bendis and Hickman and it's all back to nothing. 1. 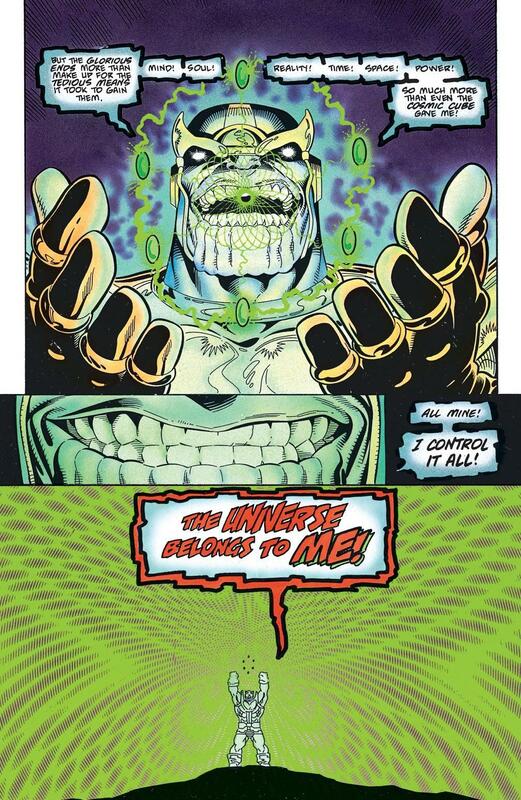 Can the Infinite Stones can affect digital aspects? Like, by all means, they can only affect their natural universe and "natural" forms of space, material, and life... however, would they work in a world of binary information? Like in Tron or Digimon? 1. Well, the physical computers would have to be in the real world, right? It stands to reason that if he affects one, it'd affect the other. Still, by that logic, it could only work if he were outside the digital world. 2. Well, in Kingdom Hearts, Hearts are closer to what we'd think of as a soul, the culmination of someone's thoughts, emotions and spirituality, whereas a 'soul' in that 'verse is more like a spark of life. It wouldn't surprise me if an Infinity Gauntlet in the KH world would replace the gem with a Heart Stone. As for nothingness...well, I think that'd be Reality's domain more than anything, since it requires rewriting how the universe functions. 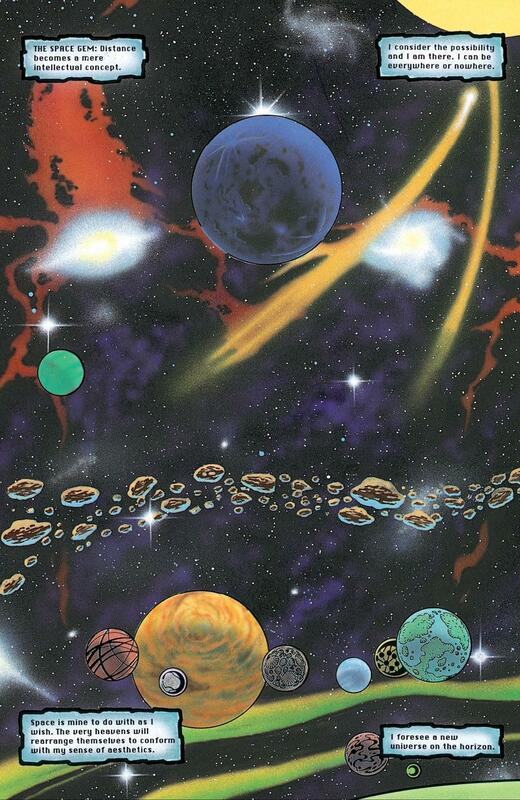 Funny thing is, Digimon has its own equivalent of the Infinity Gems/Stones, the Digimemories from the Digimon NEXT manga (not to be confused with the items with the same name from Digimon Xros Wars), which assemble to create NEO, a godlike entity who basically is capable of destroying and recreating the universe (yes, including the physical universe). The only reason he doesn't outright do so is because that series' gogglehead and his partner punch a hole through him through sheer determination - it doesn't actually do any meaningful damage, but he decides that these guys have moxie and maybe keeping the current universe around might not be such a bad idea after all. ... 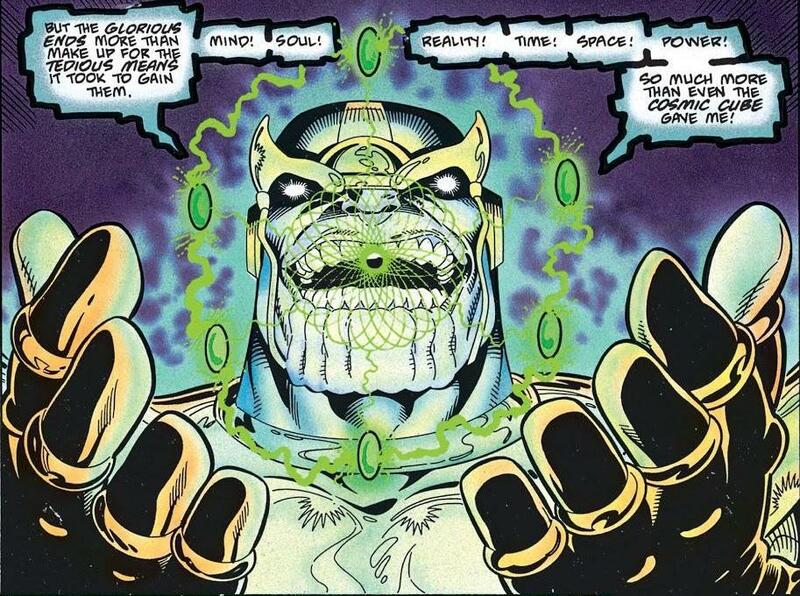 I don't want to imagine what would happen if a Thanos with the Gauntlet, NEO and Zen-O from Dragon Ball got into a fight for whatever reason.